Journal of an Astronaut by G. Sutton Breiding presents poetry from the editor of Punk-Surrealist Cafe, and author of two previous books of poems, Autumn Roses (1984) and Necklace of Blood (1988). His poems of recondite mysticism, vision, and imagination have been published in The Romanticist, Grue, Narcopolis, Memory Leaves, Nebula Awards 26, Recursive Angel, and in many other magazines. 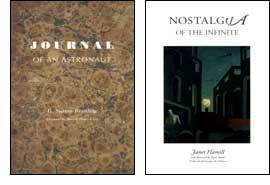 Presented in an upside-down-and-back-to-back format with Nostalgia of the Infinite by Janet Hamill. Hamill's is a true American voice. Her work has appeared in Abraxas, BOMB, City Lights Review, Kansas Quarterly, Konglomerati, New Leaves, Timbuktu, UP LATE: American Poetry Since 1970, and in many other magazines, journals, and anthologies. Her play Delouz Entago was performed at the Poet's Theatre in New York City, and she is a member of the Poetry Society of America. Nostalgia of the Infinite is introduced by writer and recording artist Patti Smith.